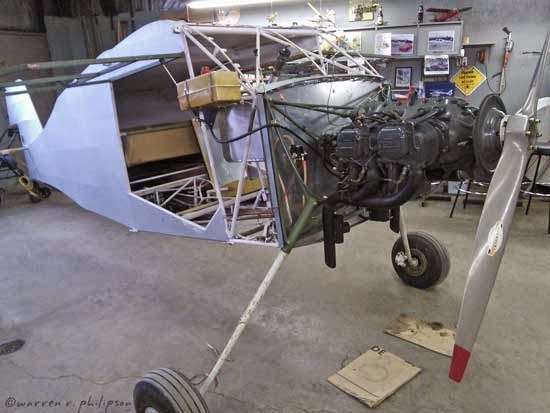 After last Friday’s blog post about the Wittman Buttercup airplane and its designer, Steve Wittman (Building a Buttercup (Airplane)), I thought you might like a closer look at the Buttercup being built in my father-in-law's shop. The Buttercup in progress. The small, yellowish container between the door and engine is a temporary gas tank. It may change, but they’re using a Lycoming 100 Horsepower engine (O-235-C), seen here from the passenger/co-pilot’s side and front. 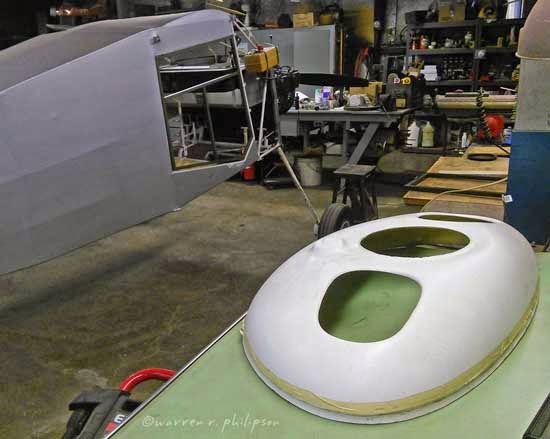 A fiberglass cowl will fit behind the propeller to protect the Buttercup engine. They found a mold for a larger engine cover and may make a new one. 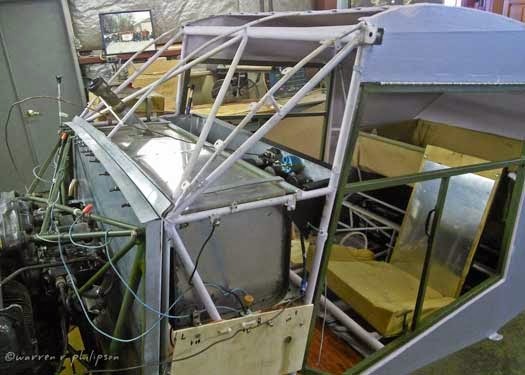 A view of the dual-control Buttercup cockpit from the pilot’s seat. 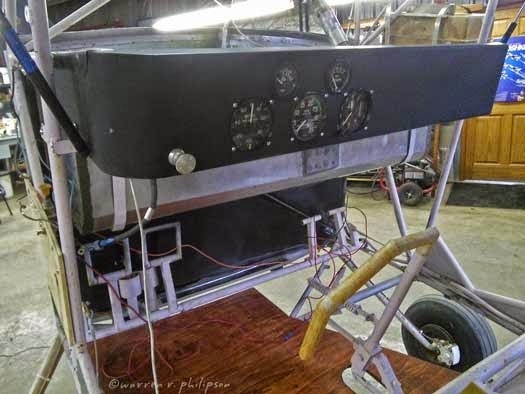 From the bottom, the curved, yellowish-handle stick (control yoke) manages flight roll and pitch (aiming up or down), and the rudder pedals control yaw (turning left or right) and braking (pushing top of pedal downward). 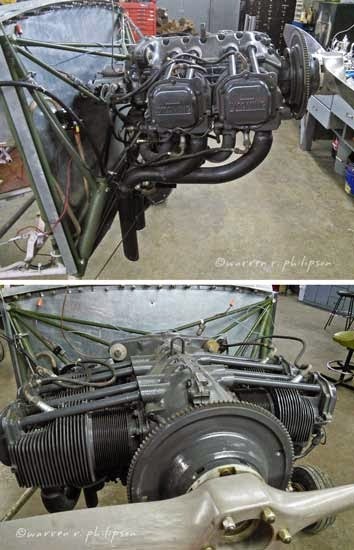 On the panel, the silver knob primer functions like an old car choke to pump a little fuel directly into the engine cylinders for starting the engine; the lower dials read airspeed (mph), engine revolutions per minute and aircraft height; and the upper dials read oil temperature and pressure. A side view of the Buttercup cockpit, showing the top and back of the panel, the throttle to control speed (thrust) temporarily protruding upward through the future cockpit windshield on the passenger/co-pilot’s side, and the hard to see battery behind the future passenger/co-pilot’s seat. The Buttercup’s tapered landing gear. 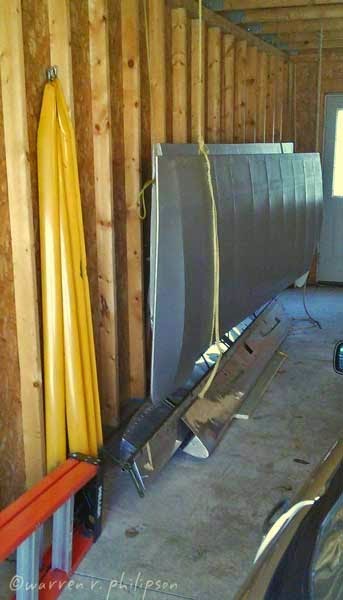 The Buttercup wings, slats and flaps, which Wittman designed to allow the pilot to change wing curvature, were completed early in the process and stored in a garage with the yellow, pole-like wing struts.